This is the second Telgemeier graphic novel I have read, and it was a very quick read! Like less than an hour quick. Drama follows a girl named Callie. And also, drama follows Callie! Callie, a seventh grader, is the set designer for her junior high drama club. She likes a boy, but he has a girlfriend. He kisses her one day after a fight with his girlfriend, but his younger brother, who has a crush on Callie, find out and treats her badly all year. Then she meets twins, one of which is out of the closet, and the other who claims not to be gay. 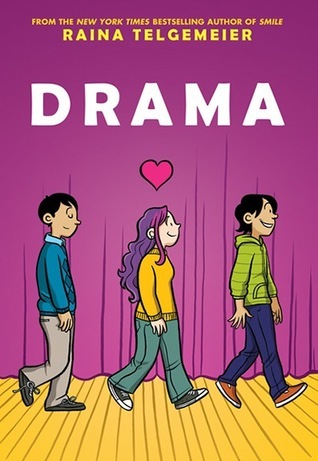 Lots of boy-girl drama in this story! It was a little hard to keep some of the characters straight. What I liked about this book was that it touched on the topic of homosexuality and being unsure of other people. I haven’t read any children’s literature that talked about that, although I’m sure it’s out there. The characters were all accepting and their reactions were realistic. I’m sure in reality, there will be students who are homophobic or make fun of their peers who are gay, but that did not take place in this book. I liked that, because the topic was written about in an accepting tone where it made being gay a non-issue. 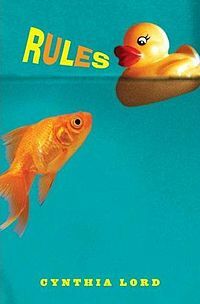 What I didn’t like about this book was the drama for a seventh grader! Maybe I’m a prude, but since when did 7th and 8th graders go around making out with people? I had my first kiss in seventh grade, and it was a peck during Truth or Dare. I didn’t actually make out with anyone until the summer before high school, and it wasn’t as natural as the book made it seem. I don’t think students should feel pressured to kiss someone or have a boyfriend, but I also think that could just be the age. I remember wanting a boyfriend in seventh grade, but I also still played with Barbies. Anyway, good book. I hope it makes young people feel more comfortable with who they are, and realize being gay is part of a person’s identity, and not a disease or disability. This book comes at the request of one of my students. When I set my basket on the table and asked them to choose “must reads” for me over the summer, he put Smile into the basket, and then chose Drama by the same author. I didn’t ask him why he chose these two books, but because of this particular student, I accepted the request. I also had seen the books on the shelves at Barnes & Noble (aka Mecca), and the woman who works there said it was a good book. 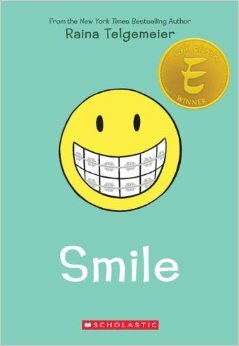 So this is the story of a girl named Raina Telgemeier. I have to assume that since the author shares her name, it is autobiographical. It is set during the late eighties in San Francisco. Raina is a seventh grader and falls after a girl scouts meeting and knocks her two front teeth out. It is obviously very painful, but also mortifying as a junior high student to be missing teeth. The story follows her for several years through her many procedures to fix her teeth. We also witness her struggle with the pains of puberty, her first crushes, and viciously mean girls. The story has a happy ending when her teeth are fixed. What I liked about this book was that it was all written as a comic book! Is that what brought it down to a 2.6 reading level? Because I really don’t see a second grader reading about zits, crushes, and broken, bloody teeth. In the story, Raina wants to become an animator and shows interest in art. It would make sense that she achieved her dream and is now a graphic novelist. Another thing I liked was that Raina struggled with her self-image and had mean, mean friends. As a reader, we look at her and know that she should be happy with who she is, and we want her to see that her friends are awful and she deserves better. As a tween? It’s not so easy to think the same when in her situation. I appreciate books with a strong, relatable moral. As a bonus, the website comes with a comic designer so you can continue the story with Raina. What I didn’t like about this book was that it was a 2.6 level. I’ve said before that it’s hard for me to get through easy books, and this was one of them. I think there are ways it could have been more challenging, but I also see that the author was writing it from Raina’s perspective, so of course she’s not going to use 50-cent vocabulary words. 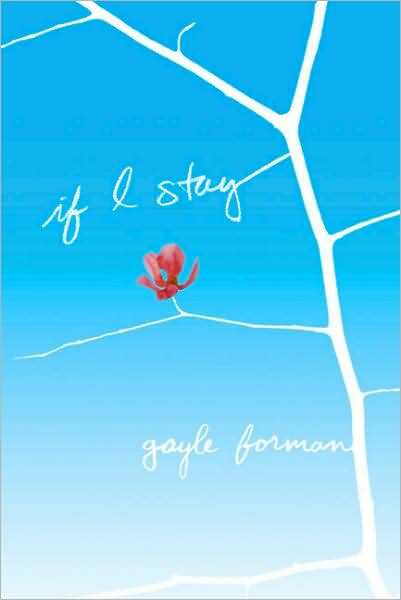 I downloaded If I Stay as an audiobook last Monday, because I had a long car ride (well, not a long distance, but a lot of traffic) and I get antsy when it’s just the radio. A few times, I ended up sitting at my destination, but I couldn’t get out of the car until we came to a good pause in the story. I cut all of my lamination and worked in my classroom while listening, because I had to know if she decided to stay or die. No, it’s not another suicide book. This is the story of Mia, a talented cellist with an eccentric but loving family, and a punker boyfriend. One morning, she and her family get into a horrific car accident, and she’s put into a medically induced coma due to her extreme injuries. She discovers she is able to leave her body and follow people around the hospital while they mourn for her family and suffer with not knowing what will become of her. Memories of her childhood, family, and past experiences flood her and help her make the decision if she should stay and experience all of those things she’s meant to experience, or die and be with her family. Of course, she is visited by several family members, her best friend, and her boyfriend, all of whom want her to stay, of course. It is only Gramps who gives her permission to go. I won’t spoil the ending for you as long as you don’t google the book. If you do, you’ll immediately see her choice! I’m putting If I Stay in the same category as The Fault In Our Stars, because there are so many similarities. Two teenagers who have a relationship beyond their years. Parents approve. People die. Some parts make you want to cry. You think about what would happen if someone you loved more than anything in the world died- would you be able to go on? So it’s like The Fault In Our Stars, just not as good. But I won’t hold that against Gayle Forman. What I didn’t like about this book: I contemplated what I would do in that same situation. That made me think of what I would do if I lost my husband and children. Would I go on? I don’t even want to go there, because my answer will spin me into a sobbing mess. So I won’t think about it, and you shouldn’t either, because it’s just a book. Seriously. I’m going to read something light-hearted and funny next, I think. Have you seen this movie? I rarely see the movie before reading the book, but I didn’t even realize it was a book until I looked it up after watching with my daughters. The movie was “eh” for me, but my oldest loved it so much, I had to read the book to find out more! It appears to be a popular series, but I’d only heard of the movie. There are 12 books total. It isn’t clear to me whether they are all told by Hiccup (that’s the protagonist’s name), or someone else, but I haven’t really done my research, either. 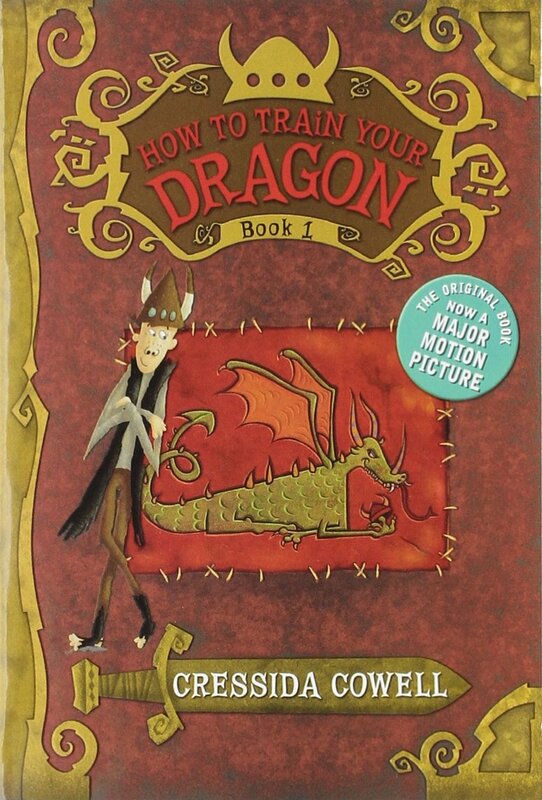 How To Train Your Dragon is set in the era and region of Vikings. Hiccup is the son of a big tough head Viking, but he is small and skinny and not so brave. He is faced with the task (with several other boys his age) of capturing a baby dragon and training him to do certain things. The dragon-training “Bible” is only 1 sentence long, and tells its reader that to train a dragon, you have to yell at it. This doesn’t sit well with Hiccup, so being fluent in Dragonese, he attempts to reason with the dragon. Dragons are stubborn and selfish by nature, so Hiccup has some trouble, but in the end, you’ll see he has a greater affect than he previously thought. There is the Big Climax in the story in which Hiccup is revealed to use his wits and resourcefulness rather than brawn and muscles to defeat the antagonist in the story. Of course. Because every good children’s story has to have a main character who is smart and kind to defeat evil. What I liked about this book was that yes, it is predictable. It has a likable, internally good protagonist who wins in the end, despite the hecklers and bullies who don’t believe in him. It is a children’s book that should have been made into a movie. I think some kids need that predictability in a story, because if the author had killed Hiccup or Toothless, they would have thrown this book across the room. The story is written with humor (they use someone’s bra and another’s underwear as slingshots) that children (especially boys) enjoy. If I can get one of my boys who hates to read this series, I will have won. What I didn’t like this book… I can’t really say. It just wasn’t for me. It was good. It was entertaining. I wanted to see how it ended. It just took me a really, really, really long time to get through. I lost it for a few days and read something else. I can see a book as being well-written without wanting to read it again. Will I buy the series for my classroom? Maybe. If I can get a few hooked on Hiccup, I will have to look into it. On a tangent… Can I tell you how excited I am about a book I bought today? It’s called The Mysterious Benedict Society. I’ve seen it in the book store (my happy place) for awhile now, and the cover has always caught my attention. Today I actually picked it up and read the back. In big red letters is the following quote: “Are you a gifted child looking for special opportunities?” Yes! I teach a class of gifted learners (some identified, some not, but brilliant in their own ways). This is a book that I look forward to telling them about when we start school again. Plus, there are 5 books (so far?)! Plus, it is nearly 500 pages. I need to fly through the rest of my books and use this as my reward! I was in search of a book to teach tolerance for my class at the beginning of the year. Sixth grade is a mysterious year. They seem to grow a foot over the summer, some boys’ voices start to change, girls suddenly care about what they look like, and the room smells… not the fifth grade “I needed to start using deodorant 3 months ago” smell, but Axe and fruity Dollar Tree body spray start being applied by the gallon. What isn’t so mysterious is that kids start noticing each other, and they start to see differences. So, I thought that a book about being tolerant of others and secure with ourselves would be a good way to start the year, and since Rules has gotten such great reviews, what better way to start? This is a story about a girl named Catherine. Her younger brother, David, has autism, and she longs to have a “normal” brother and a “normal” family. To help her brother, she makes a list of rules and social cues for him to follow, but these rules seem to help her as much as they help him. Catherine is excited to make friends with her new neighbor, a girl her own age who appears to be in a higher social category, due to her hair, make up, and relationship with Ryan, the cool boy and David’s bully. One day at David’s OT, Catherine befriends Jason, a boy in a wheelchair who relies on PECS (Picture Exchange Communication System). The author never specifically mentions what disability Jason has, but he is in a motorized wheelchair and cannot speak, although he can hear what is going on as well as a non-disabled teenager would. Throughout the story, Catherine struggles: she feels burdened by having to watch David, because he is a handful and embarrasses her. However, she also struggles with people bullying or not understanding him. She finds a special friendship with Jason, but she doesn’t want her friends to make fun of him, or her for their relationship. In the end, Catherine has to realize that she is the one who needs to change her point of view. What I liked about this book was the insight into the life of someone living with someone with autism. Was that a confusing sentence? I am starting my 13th year teaching. I taught a special day class for a few years in there. I have had many, many students with autism in general and special education, but it wasn’t until this past year that I had a student with a sibling with autism. Depending on the needs of the child, it can be especially hard on the siblings and other family members. Catherine struggled, and I like that her friends were more understanding than she was, and they helped her to be more accepting. I think this would be a good book for students to read, and I plan to discuss it in detail. What I didn’t like about this book was that it could have been longer or more detailed. I thought Ryan needed another lesson in being respectful. Kristi was able to show her tolerance and acceptance, but Ryan wasn’t really given a chance to redeem himself. Here’s what I’m starting to realize… I love children’s books, but I don’t love all of them. I am really disappointed when the theme is good but the content isn’t challenging, or when it leaves me wishing it was better. I kind of felt that way with this book. It had the well-developed main character, I appreciated the message, but it didn’t leave me wanting more. I stayed up a little past my bedtime to finish it, but I didn’t wake up wishing I hadn’t. I’m also currently reading How To Train Your Dragon and The Life of Billy Miller and, I’m getting that same feeling about both, which is why I had to put those down and pick up something different. I think I’m becoming an even pickier reader than I already am!